Under the Treaty the Council may, by means of directives, adopt minimum requirements for encouraging improvements, especially in the working environment, to guarantee a better level of protection of the health and safety of workers. Such directives are to avoid imposing administrative, financial and legal constraints in a way which would hold back the creation and development of small and medium-sized enterprises (SMEs). The communication from the Commission concerning its action programme relating to the implementation of the Community Charter of the Fundamental Social Rights of Workers provides for the introduction of minimum health and safety requirements regarding the exposure of workers to the risks caused by physical agents. In September 1990 the European Parliament adopted a Resolution concerning this action programme ( 4 ), inviting the Commission in particular to draw up a specific directive on the risks caused by noise, vibration and any other physical agents at the workplace. As a first step, the European Parliament and the Council adopted Directive 2002/44/EC of 25 June 2002 on the minimum health and safety requirements regarding the exposure of workers to the risks arising from physical agents (vibration) (16th individual Directive within the meaning of Article 16(1) of Directive 89/391/EEC) ( 5 ). Next, on 6 February 2003 the European Parliament and the Council adopted Directive 2003/10/EC on the minimum health and safety requirements regarding the exposure of workers to the risks arising from physical agents (noise) (17th individual Directive within the meaning of Article 16(1) of Directive 89/391/EEC) ( 6 ). Thereafter, on 29 April 2004, the European Parliament and the Council adopted Directive 2004/40/EC on the minimum health and safety requirements regarding the exposure of workers to the risks arising from physical agents (electromagnetic fields) (18th individual Directive within the meaning of Article 16(1) of Directive 89/391/EEC) ( 7 ). It is now considered necessary to introduce measures protecting workers from the risks associated with optical radiation, owing to its effects on the health and safety of workers, in particular damage to the eyes and to the skin. These measures are intended not only to ensure the health and safety of each worker on an individual basis, but also to create a minimum basis of protection for all Community workers, in order to avoid possible distortions of competition. One of the aims of this Directive is the timely detection of adverse health effects resulting from exposure to optical radiation. This Directive lays down minimum requirements, thus giving Member States the option of maintaining or adopting more stringent provisions for the protection of workers, in particular the fixing of lower exposure limit values. The implementation of this Directive must not serve to justify any deterioration in the situation which already prevails in each Member State. A system of protection against the hazards of optical radiation should limit itself to a definition, free of excessive detail, of the objectives to be attained, the principles to be observed and the basic values to be applied, in order to enable Member States to apply the minimum requirements in an equivalent manner. The level of exposure to optical radiation can be more effectively reduced by incorporating preventive measures into the design of workstations and by selecting work equipment, procedures and methods so as to give priority to reducing the risks at source. Provisions relating to work equipment and methods thus contribute to the protection of the workers involved. In accordance with the general principles of prevention as laid down in Article 6(2) of Council Directive 89/391/EEC of 12 June 1989 on the introduction of measures to encourage improvements in the safety and health of workers at work ( 8 ), collective protection measures have priority over individual protection measures. Employers should make adjustments in the light of technical progress and scientific knowledge regarding risks related to exposure to optical radiation, with a view to improving the safety and health protection of workers. Since this Directive is an individual directive within the meaning of Article 16(1) of Directive 89/391/EEC, that Directive applies to the exposure of workers to optical radiation, without prejudice to more stringent and/or specific provisions contained in this Directive. This Directive constitutes a practical step towards creating the social dimension of the internal market. A complementary approach that both promotes the principle of better regulation and ensures a high level of protection can be achieved where the products made by the manufacturers of optical radiation sources and associated equipment comply with harmonised standards devised to protect the health and safety of users from the hazards inherent in such products; accordingly, it is not necessary for employers to repeat the measurements or calculations already undertaken by the manufacturer to determine compliance with the essential safety requirements of such equipment as specified in the applicable Community Directives, provided that the equipment has been properly and regularly maintained. The measures necessary for the implementation of this Directive should be adopted in accordance with Council Decision 1999/468/EC of 28 June 1999 laying down the procedures for the exercise of implementing powers conferred on the Commission ( 9 ). Adherence to the exposure limit values should provide a high level of protection as regards the health effects that may result from exposure to optical radiation. The Commission should draw up a practical guide to help employers, in particular managers of SMEs, better to understand the technical provisions of this Directive. The Commission should strive to complete this guide as quickly as possible so as to facilitate adoption by the Member States of the measures necessary to implement this Directive. 1. This Directive, which is the 19th individual Directive within the meaning of Article 16(l) of Directive 89/391/EEC, lays down minimum requirements for the protection of workers from risks to their health and safety arising or likely to arise from exposure to artificial optical radiation during their work. 2. This Directive refers to the risk to the health and safety of workers due to adverse effects caused by exposure to artificial optical radiation to the eyes and to the skin. (i) level: the combination of irradiance, radiant exposure and radiance to which a worker is exposed. 1. The exposure limit values for non-coherent radiation, other than that emitted by natural sources of optical radiation, are as set out in Annex I. 2. The exposure limit values for laser radiation are as set out in Annex II. 1. In carrying out the obligations laid down in Articles 6(3) and 9(1) of Directive 89/391/EEC, the employer, in the case of workers exposed to artificial sources of optical radiation, shall assess and, if necessary, measure and/or calculate the levels of exposure to optical radiation to which workers are likely to be exposed so that the measures needed to restrict exposure to the applicable limits can be identified and put into effect. The methodology applied in assessment, measurement and/or calculations shall follow the standards of the International Electrotechnical Commission (IEC) in respect of laser radiation and the recommendations of the International Commission on Illumination (CIE) and the European Committee for Standardisation (CEN) in respect of non-coherent radiation. In exposure situations which are not covered by these standards and recommendations, and until appropriate EU standards or recommendations become available, assessment, measurement and/or calculations shall be carried out using available national or international science-based guidelines. In both exposure situations, the assessment may take account of data provided by the manufacturers of the equipment when it is covered by relevant Community Directives. 2. The assessment, measurement and/or calculations referred to in paragraph 1 shall be planned and carried out by competent services or persons at suitable intervals, taking particular account of the provisions of Articles 7 and 11 of Directive 89/391/EEC concerning the necessary competent services or persons and the consultation and participation of workers. The data obtained from the assessment, including those obtained from the measurement and/or calculation of the level of exposure referred to in paragraph 1 shall be preserved in a suitable form so as to permit their consultation at a later stage. (j) information provided by the manufacturers of optical radiation sources and associated work equipment in accordance with the relevant Community Directives. 4. The employer shall be in possession of an assessment of the risk in accordance with Article 9(1)(a) of Directive 89/391/EEC and shall identify which measures must be taken in accordance with Articles 5 and 6 of this Directive. The risk assessment shall be recorded on a suitable medium, according to national law and practice; it may include a justification by the employer that the nature and extent of the risks related to optical radiation make a further, detailed risk assessment unnecessary. The risk assessment shall be updated on a regular basis, particularly if there have been significant changes which could render it out of date, or if the results of health surveillance show it to be necessary. 1. Taking account of technical progress and of the availability of measures to control the risk at source, the risks arising from exposure to artificial optical radiation shall be eliminated or reduced to a minimum. The reduction of risks arising from exposure to artificial optical radiation shall be based on the general principles of prevention set out in Directive 89/391/EEC. (h) the instructions of the manufacturer of the equipment where it is covered by relevant Community Directives. 3. On the basis of the risk assessment carried out in accordance with Article 4, workplaces where workers could be exposed to levels of optical radiation from artificial sources exceeding the exposure limit values shall be indicated by appropriate signs in accordance with Council Directive 92/58/EEC of 24 June 1992 on the minimum requirements for the provision of safety and/or health signs at work (9th individual Directive within the meaning of Article 16(1) of Directive 89/391/EEC) ( 11 ). The areas in question shall be identified, and access to them limited where this is technically possible and where there is a risk that the exposure limit values could be exceeded. 4. Workers shall not be exposed above the exposure limit values. In any event, if, despite the measures taken by the employer to comply with this Directive in respect of artificial sources of optical radiation, the exposure limit values are exceeded, the employer shall take immediate action to reduce exposure below the exposure limit values. The employer shall identify the reasons why the exposure limit values have been exceeded and shall adapt the protection and prevention measures accordingly in order to prevent them being exceeded again. 5. Pursuant to Article 15 of Directive 89/391/EEC, the employer shall adapt the measures referred to in this Article to the requirements of workers belonging to particularly sensitive risk groups. (g) proper use of appropriate personal protective equipment. 1. With the objectives of the prevention and timely detection of any adverse health effects, as well as the prevention of any long-term health risks and any risk of chronic diseases, resulting from exposure to optical radiation, Member States shall adopt provisions to ensure appropriate health surveillance of workers pursuant to Article 14 of Directive 89/391/EEC. 2. Member States shall ensure that health surveillance is carried out by a doctor, an occupational health professional or a medical authority responsible for health surveillance in accordance with national law and practice. 3. Member States shall establish arrangements to ensure that, for each worker who undergoes health surveillance in accordance with paragraph 1, individual health records are made and kept up to date. Health records shall contain a summary of the results of the health surveillance carried out. They shall be kept in a suitable form so as to permit consultation at a later date, taking into account any confidentiality. Copies of the appropriate records shall be supplied to the competent authority on request, taking into account any confidentiality. The employer shall take appropriate measures to ensure that the doctor, the occupational health professional or the medical authority responsible for the health surveillance, as determined by Member States as appropriate, has access to the results of the risk assessment referred to in Article 4 where such results may be relevant to the health surveillance. Individual workers shall, at their request, have access to their own personal health records. — arrange continued health surveillance and provide for a review of the health status of any other worker who has been similarly exposed. In such cases, the competent doctor or occupational health professional or the competent authority may propose that the exposed persons undergo a medical examination. Member States shall provide for adequate penalties to be applicable in the event of infringement of the national legislation adopted pursuant to this Directive. These penalties must be effective, proportionate and dissuasive. 1. Any modification of the exposure limit values set out in the Annexes shall be adopted by the European Parliament and the Council in accordance with the procedure laid down in Article 137(2) of the Treaty. (b) technical progress, changes in the most relevant harmonised European standards or international specifications, and new scientific findings concerning occupational exposure to optical radiation. Those measures, designed to amend non-essential elements of this Directive, shall be adopted in accordance with the regulatory procedure with scrutiny referred to in Article 11(2). On imperative grounds of urgency, the Commission may have recourse to the urgency procedure referred to in Article 11(3). 1. The Commission shall be assisted by the Committee referred to in Article 17 of Directive 89/391/EEC. In order to facilitate implementation of this Directive the Commission shall draw up a practical guide to the provisions of Articles 4 and 5 and Annexes I and II. 1. Member States shall bring into force the laws, regulations and administrative provisions necessary to comply with this Directive by 27 April 2010. They shall forthwith inform the Commission thereof. 2. Member States shall communicate to the Commission the text of the provisions of national law which they adopt or have already adopted in the field covered by this Directive. The biophysically relevant exposure values to optical radiation can be determined with the formulae below. 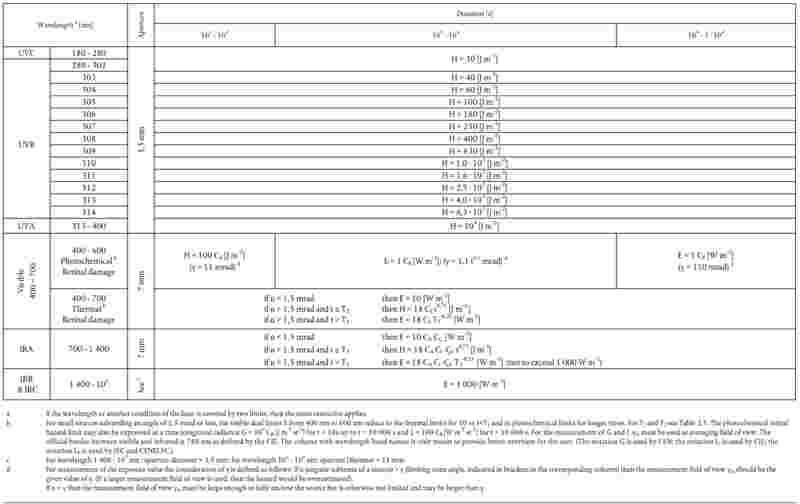 The formulae to be used depend on the range of radiation emitted by the source and the results should be compared with the corresponding exposure limit values indicated in Table 1.1. More than one exposure value and corresponding exposure limit can be relevant for a given source of optical radiation. Numbering (a) to (o) refers to corresponding rows of Table 1.1.
angular subtense: the angle subtended by an apparent source, as viewed at a point in space, expressed in milliradians (mrad). Apparent source is the real or virtual object that forms the smallest possible retinal image. Note 1: The range of 300 to 700 nm covers parts of UVB, all UVA and most of visible radiation; however, the associated hazard is commonly referred to as ‘blue light’ hazard. Blue light strictly speaking covers only the range of approximately 400 to 490 nm. Note 2: For steady fixation of very small sources with an angular subtense < 11 mrad, LB can be converted to EB. This normally applies only for ophthalmic instruments or a stabilized eye during anaesthesia. The maximum ‘stare time’ is found by: tmax = 100/EB with EB expressed in W m-2. Due to eye movements during normal visual tasks this does not exceed 100 s.
The biophysically relevant exposure values to optical radiation can be determined with the formulae below. The formulae to be used depend on the wavelength and duration of radiation emitted by the source and the results should be compared with the corresponding exposure limit values indicated in the Tables 2.2 to 2.4. More than one exposure value and corresponding exposure limit can be relevant for a given source of laser optical radiation. Coefficients used as calculation tools within the Tables 2.2 to 2.4 are listed in Table 2.5 and corrections for repetitive exposure are listed in Table 2.6.
integrated radiance: the integral of the radiance over a given exposure time expressed as radiant energy per unit area of a radiating surface per unit solid angle of emission, in joules per square metre per steradian [J m-2 sr -1]. 1. The exposure from any single pulse in a train of pulses shall not exceed the exposure limit value for a single pulse of that pulse duration. 2. The exposure from any group of pulses (or sub-group of pulses in a train) delivered in time t shall not exceed the exposure limit value for time t.
3. The exposure from any single pulse within a group of pulses shall not exceed the single-pulse exposure limit value multiplied by a cumulative-thermal correction factor Cp=N-0,25, where N is the number of pulses. This rule applies only to exposure limits to protect against thermal injury, where all pulses delivered in less than Tmin are treated as a single pulse. In the opinion of the Council, when the word ‘penalties’ is used in the English version of legal instruments of the European Community, this word is used in a neutral sense and does not relate specifically to criminal law sanctions, but could also include administrative and financial sanctions, as well as other types of sanction. When Member States are obliged under a Community act to introduce ‘penalties’, it is up to them to choose the appropriate type of sanction in conformity with the case law of the European Court of Justice. in Spanish, ‘sanciones’; in Danish, ‘sanktioner’; in German, ‘Sanktionen’; in Hungarian, ‘jogkövetkezmények’; in Italian, ‘sanzioni’; in Latvian, ‘sankcijas’; in Lithuanian, ‘sankcijos’; in Dutch, ‘sancties’; in Portuguese, ‘sanções’; in Slovak, ‘sankcie’; and in Swedish, ‘sanktioner’. If, in revised English versions of legal instruments where the word ‘sanctions’ has previously been used, this word is replaced with the word ‘penalties’, this does not constitute a substantive difference. ( 1 ) OJ C 77, 18.3.1993, p. 12 and OJ C 230, 19.8.1994, p. 3. ( 2 ) OJ C 249, 13.9.1993, p. 28. ( 3 ) Opinion of the European Parliament of 20 April 1994 (OJ C 128, 9.5.1994, p. 146) confirmed on 16 September 1999 (OJ C 54, 25.2.2000, p. 75), Council Common Position of 18 April 2005 (OJ C 172 E , 12.7.2005, p. 26) and Position of the European Parliament of 16 November 2005 (not yet published in the Official Journal), European Parliament Legislative Resolution of 14 February 2006 (not yet published in the Official Journal) and Decision of the Council of 23 February 2006. ( 4 ) OJ C 260, 15.10.1990, p. 167. ( 5 ) OJ L 177, 6.7.2002, p. 13. ( 6 ) OJ L 42, 15.2.2003, p. 38. ( 7 ) OJ L 159, 30.4.2004, p. 1. Directive as corrected in OJ L 184, 24.5.2004, p. 1. ( 8 ) OJ L 183, 29.6.1989, p. 1. Directive as amended by Regulation (EC) No 1882/2003 of the European Parliament and of the Council (OJ L 284, 31.10.2003, p. 1). ( 9 ) OJ L 184, 17.7.1999, p. 23. ( 10 ) OJ C 321, 31.12.2003, p. 1. ( 11 ) OJ L 245, 26.8.1992, p. 23.